The Jetsons have landed in Brentwood! 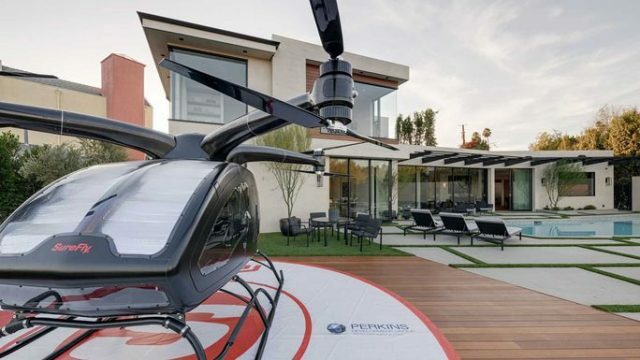 A new home in Los Angeles is being advertised as a house of the futurewith several space-age features including a two-passenger drone mini helicopter that the new owner can actually fly to work. At $11.995 million, a small price for time travel. The contemporary-style house of more than 8,000 square feet is filled with futuristic innovation, run on an off-grid system that releases its owner from dependency of ever escalating grid-price increases and outages. Powered by solar panels and backed by two Tesla Powerwalls, the six-bedroom, eight-bath home features 28-foot retractable glass walls that blend the large open floor plan with the pool deck, spectacular views and the personal drone helicopter landing pad providing lots of space for outdoor dining and entertaining. There are two master bedroom suites on separate floors with expansive baths and voluminous dressing rooms plus an indoor terrarium. All surfaces have been dressed with designer finishes and fixtures, hardwood floors and the garage comes with an underground car lift. The lower gallery level includes a large gym, art-ready gallery space and far-infrared sauna. For the more traditional home owner, there is also a living room fireplace. The pièce de résistance is the first-of-its-kind, two-passenger personal drone helicopter, SureFly, that will whisk its owner from Brentwood to Burbank in 10 minutes during heavy rush hour traffic. It takes off from its integrated helipad on the pool terrace to fly over the L.A. gridlock. According to the SureFly website, it can fly one hour on one tank of gas, flies to a maximum ceiling of 4,000 feet, has a 70-mile range, is an 8-rotor helicopter with on-board fully redundant backup battery system and can accommodate two passengers. The listing agent is Billy Rose from The Agency in Beverly Hills. One of the main stars in ‘Star Trek: The Next Generation’ was a contemporary-style house that has just hit the market for $5.695 million. The Malibu home was the main location in which Captain Jean-Luc Picard (Patrick Stewart) and his Starship Enterprise crew land on a seemingly deserted planet. They find two people who appear to have miraculously survived a disaster that claimed the lives of the rest of the population. In the film, the house and grounds appear exactly as they do today, but with the magic of film showed a vast wasteland surrounding the property. Their entire neighborhood for as far as the eye could see, was stolen by a massive spaceship which they were unable to identify. Designed by futuristic architect/artist and furniture designer Ellis Gelman, the eye-popping, wedge-shaped housefeatures both circular and triangular windows, as well as dramatic angles. Sited on over two acres on the Pacific Coast Highway, the four-bedroom, four-bath home features a large open-concept main living area with soaring wood-clad ceilings and spectacular views. It has a chef’s kitchen with emerald-stone counter tops, breakfast bar and built-ins, media/family room with kitchenette, loft, and ocean-view terrace. There are two fireplaces, master suite with spa-like bath, sound system, slate tile and bamboo flooring, 10-car parking, a detached guest unit/office/gym with bath, an enclosed patio with a lavender and rose garden. The listing agent is Ani Dermenjian of Coldwell Banker in Malibu, California. Previous articleA new interactive Theater Experience in West Hollywood.